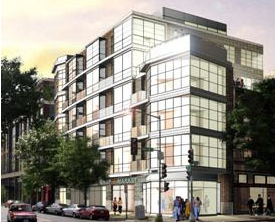 The Cooper Lewis, located at 1413 P St NW, began delivery in July 2006 [see project profile here]. Through January 2007, the District recorded 19 sales transactions; 4 units of the 20 that were built have either not sold or have not yet had their sales recorded. A combination of a historic building renovation and new construction resulted in 18 luxury 2-bedroom units that feature high ceilings, expanses of glass, terraces and patios. There are 13 different floor plans. Designed by RTKL Associates. Original prices started in the $600's. The building, on the corner of P St NW and 14th St NW, is on the same block of P Street as Whole Foods, Logan Tavern, and, everybody's favorite watering hole, Halo. It's the third of four buildings built by Metropolis Development Company in the area, the others being the Metropole [under construction], Lofts 14, and Lofts 14 Two. I'm beginning to suspect Metropolis owns square 0209; once the Metropole is completed, Metropolis will have a building on all four corners of the block bounded by 14th and 15th Streets NW, P St. NW, and Church St. NW. The Cooper Lewis was built by Mid City Development Co. II, a joint venture between Metropolis Development and US Property Development Corp. 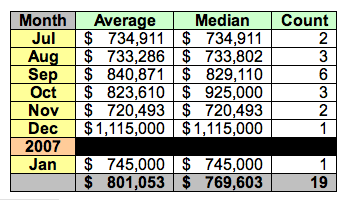 The District recorded 19 sales transactions (including three flips) through the end of January 2007.